An Asset Management System based on GIS, in the web platform is an ideal solution to the requirement of the tourism department. 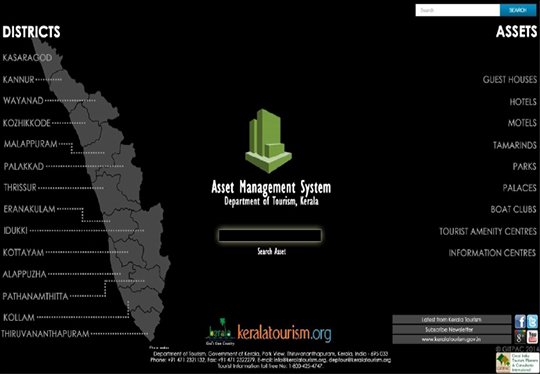 As the Department of Tourism in Kerala owns vast number of assets across Kerala, it has become an inevitable necessity to have an Asset Management System for the Department of Tourism to keep record of the assets under the ownership of the department and also be up-to-date on the structural condition, maintenance requirements, area details and proper usage of assets. It will keep record of all the assets under the ownership of the department and other centre’s like District Tourism Promotion Council, Kerala Tourism Development Council, Kerala Institute of Travel and Tourism Studies, Kerala Tourism Infrastructure Ltd. etc. It will also serve as the online information portal for the tourists providing the necessary details. The project has been initiated and is expected to be completed within the speculated time.